NS Wheeling-Nisshin's galvanized coating is one of the most effective and economical methods of protecting bare steel from a corrosive environment. 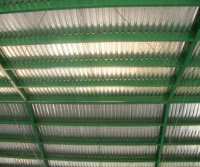 The zinc coating not only serves as a barrier between the steel and the environment, it will sacrifice itself to protect the underlying steel sheet. Thus, the spread of corrosion from cut edges, drill holes, etc. is minimized. NS Wheeling-Nisshin minimized spangle is known in the industry for its excellent paintable, flat, uniform spangle free surface. NS Wheeling-Nisshin's two state-of-the-art multi-pot coating lines provide the capability to produce a wide range of sizes, coating weights, and steel grades. 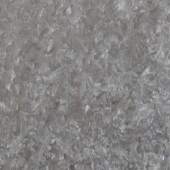 Also available is Galvanized Plus product with an acrylic coating applied to the sheet. This added coating offers additional corrosion resistance, eliminates the need for oil during rollforming, eliminates finger printing during handling, and many other advantages. All coatings and treatments can be produced to RoHS compliance when required for your particular application. 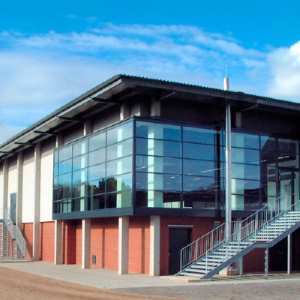 Our galvanized product has an unlimited number of uses and applications, such as automobile parts, including interior and exterior parts, appliance parts, highly formable parts, parts needing good dent resistance, heating and ventilating ducting, window framing, roofing, cornices, vending machines, microwaves, audio-visual and gaming systems, exposed parts of metal furniture, cabinets, cabinet and furniture hardware, skinning frames, trusses, decking, gutters, metal construction studs, industrial applications such as tool boxes, shelving, and lighting fixtures, and general building and utility uses. MATERIAL THICKNESS 0.008" through 0.130"
MATERIAL WIDTH 24" through 61"
COIL ID 20" and 24"
Learn about our coated steel products! Read the article about ZAM® featured in Coil World Magazine's May/June 2014 issue. 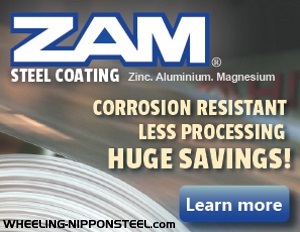 ZAM® is a registered trademark of Nippon Steel Nisshin Co., Ltd.
ZAM® is a coined name applied to the hot-dipped zinc-aluminum-magnesium-alloy-coated steel sheets developed by Nippon Steel Nisshin Co. Ltd.